Following a meeting in 1975 in the North Coast Hotel (now the White Sands), Naomh Mearnóg was born and has grown since then, from 4 local authority pitches, supplemented by the Community School pitch, to our present facilities at Pairc Mearnóg, which is one of the best and biggest of any field game club in Ireland. This is a tribute to the goodwill that exists for Naomh Mearnóg in the community of Portmarnock and to our dedicated members and various committees. Many of the founding committee members continue to play a significant role in the Club to this day. We thank them sincerely for all their hard work and commitment to this wonderful club. As part of the 40th anniversary celebrations, there will be a memorabilia display. We are, therefore, seeking the help of members in gathering old Naomh Mearnóg club memorabilia such as photograph’s, newspaper articles, programme’s etc. Such items can be left at the Club Bar for collection. If you wish to have these items returned to you, please put your name and telephone number on the back. 04/09/15 Marquee Barn Dance, BBQ, live band, line dancing, side attractions. 05/09/15 Parade of teams from Carrickhill Green up to Club. DAA Community Family Day with a variety of events for all the family e.g. Dunk Tank, Circus Skills Entertainer, Music, Games, Food tasting to mention a few. September/October Art and Poetry competition in conjunction with local schools. 20/11/15 Gala Ball including meal, awards,music and dancing until the early hours! December A Gathering in the club bar to welcome home our past members who are currently living abroad and an opportunity for them to meet former team mates and mentors. 2015/2016 Club memorabilia will be on display during the various events to mark the 40th Anniversary of the Club. Further events to follow. Watch this space! 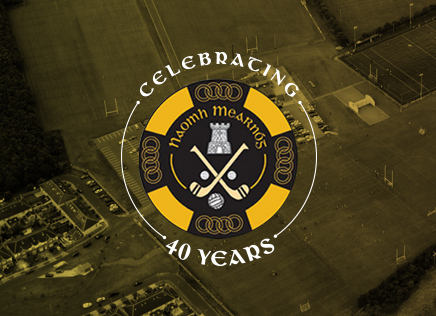 Naomh Mearnóg has its 40th anniversary this year and the 40th Anniversary Committee has a number of events planned over the coming months, all of which will be announced shortly.